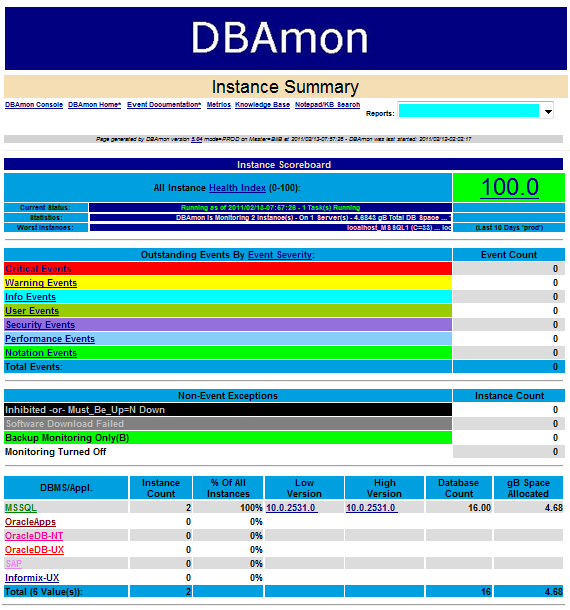 DBAmon is a free, GPL, Open-Source database monitoring tool. Although DBAmon does have a WWW-based interface, historical trend data collection and graphs, it is primarily a Background DBMS Monitoring Tool. DBAmon has been in continuous use since it was first implemented in 1994 to meet a need to monitor heterogenous DBMS environments. As of 2008 DBAmon was monitoring approximately 715 Database instances (Oracle, Informix, MSSQL, SAP) for a large international corporation. DBAmon is written primarily in Perl language (~104,000 lines of Perl code). In 2010 it was ported to run the MASTER functionality on CYGWIN, but it was developed on HP-UX. 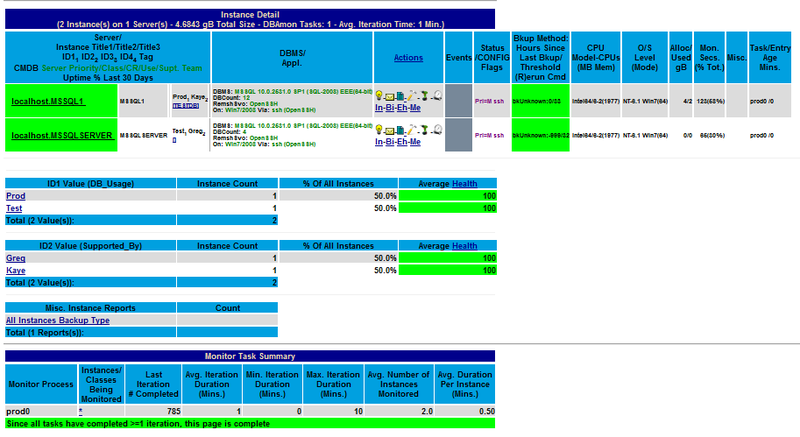 Click here to see which DBMS Metrics are monitored. WWW Status Pages, Graphs, Etc. DBAmon runs continuously monitoring every metric on every DB server (a monitored DB Server is also called a "TARGET" Server) (See What Is Monitored?). DBAmon runs on a UX server and monitors UX (Oracle and Informix) and Windows (Oracle and MSSQL) database instances. On the largest know installation of DBAmon, on a HP-UX© server it concurrently monitors over 700 Oracle, Informix and MSSQL database instances. It features easy to configure UX flat files where you specify DBAmon parameters and parameters describing the DB servers that you will be monitoring. Most neccessary customization can be done via supplied user exits (I'm showing my MVS background). The name DBAmon was originally used by a tool that was developed by Jack Parker of HP/Boise. The name DBAmon means Database & Application Monitor. The HP-UX-based-MASTER flavor of DBAmon currently runs on an HP-UX 9000 Series UX server (an N4400 8-way). It uses less than 30% of the total CPU capacity. It could easily run on a smaller server. There is no reason why the DBAmon Master would not run on another platform (Sun, AIX, Solaris, ...). The CYGWIN-based-MASTER flavor of DBAmon can run on any Windows server. It requires a working installation of Perl, which is FREE. On a CYGWIN installation, you may use MSSQL for the DBAmon repository. On UX (HP-UX, AIX, etc.) you must use an Oracle repository. If you are using an Oracle repository (HP-UX, AIX, Solaris, etc. ), then you must install the DBD/DBI interface along with Perl. See Software Installation for details. On CYGWIN, the DBI interface is very easy to install (via "cpan"). It requires a working installation of awk and Perl. Perl: V5 and DBD/DBI interface for either MSSQL or Oracle. Strawberry Perl works fine. SSH: A good SSH service (such as CopSSH) works fine. See the DBAmon Architecture Diagram for an overview of how DBAmon works. DBAmon is Agent-Less, meaning that it does not require a process to be running on a TARGET server (other than the SSH service). Downloads a Perl program to the TARGET server. This program is called the PROBE (yikes!). Again, it is a little more complex than this -- if the PROBE was previously downloaded successfully and is still working, it is not re-downloaded. Over the SSH connection to the TARGET server, the PROBE is invoked. The PROBE connects to the TARGET DB to collect all required metric data. This data is returned to the DBAmon MASTER. Now that the TARGET data has been inserted into the DBAmon repository DB on the TARGET, the current metric readings are compared to the predefined thresholds for this DB instance. If the values exceed the thresholds, or if the DB instance is found to be DOWN, etc... A DBAmon event is created. Notification occurs, etc. We needed a tool that would work in our environment and monitor what we needed to monitor. For example, we needed to monitor Informix backup age. No tool on the market at that time did this. Help Desk Tickets (can be easily customized to your environment). We knew from past experience that if we needed a modification or new DB metric to monitor that if we went with a 3rd-party tool that we may or may not get the desired change and even if the vendor agreed to our proposed modification that the time delays would be unacceptable. With DBAmon, I often have new monitors coded within a few hours of our discovering a needed enhancement. Since 1994 it has grown in usage from our data center to where it is now used by many sites around the world. In 1999 Oracle and MSSQL monitoring was added. At one site, it now continuously monitors ~800 DB Instances of Oracle, MSSQL and Informix that reside on servers located worldwide. Granted, DBAmon does not have all of the bells and whistles of the more EXPENSIVE and sophisticated tools, but it works in a real-life production environment. DBAmon is not guaranteed to serve any purpose at all. There is no warranty expressed or implied. Your mileage will vary. Yada yada yada. See DBAmon Software Installation (MASTER on UX) or DBAmon Software Installation (MASTER on CYGWIN) for the installation checklist. DBAmon is coded so that even if it is installed at a remote site, no program source changes should be necessary. The Config File mentioned below is designed to supply all site/host specific information. Some additional customization can be done by coding User Exits (see below). If you find that you have to make source changes to DBAmon, please EMail DBAmon Q&A and I will consider incorporating those changes into the next release. * - DBAmon creates the data that is used to build these graphs. 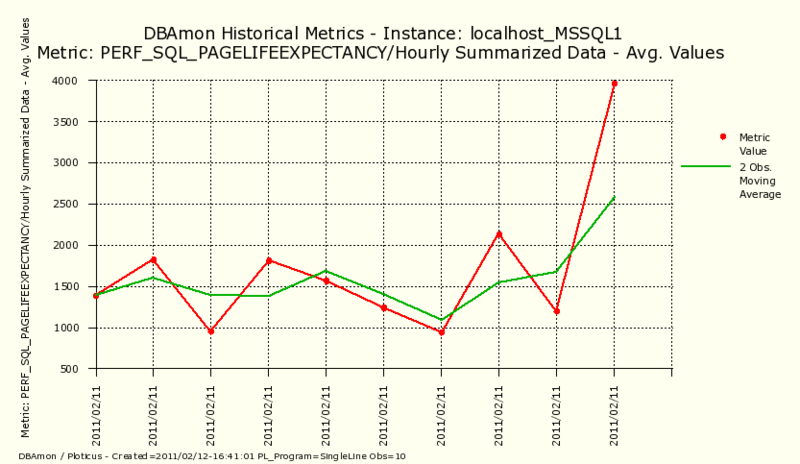 I now also ship DBAmon with PLOTICUS code to dynamically create graphs. VERY COOL! This is site is personally owned and operated by Bill Border . I am an . I am employed in Colorado Springs, Colorado as a Senior Oracle DBA. I have 30 years of IT experience, primarily as a DBA (Oracle,MSSQL,Informix,DB2,IDMS). Previously I worked as an Application Programmer (3 years), MVS Systems Programmer (10 years) and DB2 Systems Programmer (7 years). For more information, see My Resume. Microsoft SQL Server© is a registered trademark of Microsoft Corporation in the United States and/or other countries. Windows© is a registered trademark of Microsoft Corporation in the United States and/or other countries. Oracle© is a registered trademark of Oracle Corporation in the United States and/or other countries. Informix© is a registered trademark of IBM Corporation in the United States and/or other countries. SAP© is a registered trademark or SAP AG in Germany and in other countries. HP© is a registered trademark or Hewlett-Packard Corporation in the United States and in other countries.